Happy Friday! Whew it's been a long, cold, tiring week. I'm excited to sleep in tomorrow. Last night I went to an Orchestra concert at my old university. It was so beautiful! I need to get out an enrich my mind with events like that more often. No thoughts of makeup the whole time, just enjoying beautiful music. Anywho, a few weekends ago I did a makeover on a friend of a previous client. Adrienne was having a big birthday party thrown for her, and her friend gave her a makeover as a present. Her makeup was pretty easy to do. We wanted to do something fun and sparkly. On her eyes I used a mixture of purples. We put Stars N Rockets eyeshadow from MAC on her inner lid and Adrienne loved it so much she asked me to pack on some more. Moving forward, I'll get more closed eye shots so that you can see the lid colors better. As you can see in the picture, I did a little bit of contouring with the eyes. With the help of eyeshadow and liner, I gave the illusion of lifting up Adrienne's eyes on the outer corner. All with the power of makeup! Unfortunately I don't remember all of the products I used, but I thought I'd post the picture anyways. Don't you love her hair too? Short and sassy! Also, my girl Ann at www.cosmeticjunkielover.com is having $1.99 on all US Shipping orders, get your discounted NYX products! You did a great job! She looks really good! She looks so rocker chick hot after. Great job! Fabulous look Ren! I love how you made her eyes look lifted up. Have a great weekend! beautiful! purples look great on her! Damn she looks beautiful. Amazing job as usual. U r absolutely amazing! I love the color combo, great for a bday party! good job. i love the purple eyes you did on her... you really made her eyes look A LOT BIGGER. i swear purple shadows looks soo good on eyes! Wow that purple looks soo good on her. 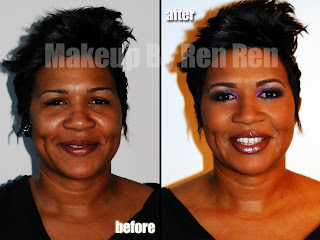 Another gorgeous makeup done by Ren Ren. she's beautiful :) you did a superb job miss ren!! I really like the before and after picture, she looks completely amazing! Keep up the work girl, you're awesome! PS- Have a relaxing weekend. Girl you hooked her UP! The concert sounds inspiring, RR! Great before and after! Hi, I wanted to let you know I've recently become a fan of your blog and would like to feature you in the coming few weeks on my own blog. I am also starting a blogroll. Just wanted to drop by and let you know! She looks fabulous!!!. I'm loving the purple which has fast become my top fav eye color. Over the weekend I went to Sephora and spent my $15 gift card. Only got two things BUT I got to try so many things I had favored. I was wondering if you could do a tutorial on how to contour eyes the way you did with the birthday girl? Thanks so much!